1. Wash and peel cucumber. Thinly slice into rounds using a sharp knife. Similarly wash and slice a tomato into thin round slices. 2. Choose a bread of your choice - multigrain, white, brown, whole wheat, etc etc. Lightly butter the slices from one side. Place a layer of cucumber slices. Now place another layer of tomato slices on top. Sprinkle lightly with salt and chaat masala (optional). Top with another slice of buttered bread, with butter side facing down. Cut into triangles or squares or rectangles based on your preference. 3. Wet a muslin cloth and squeeze it to remove extra water. 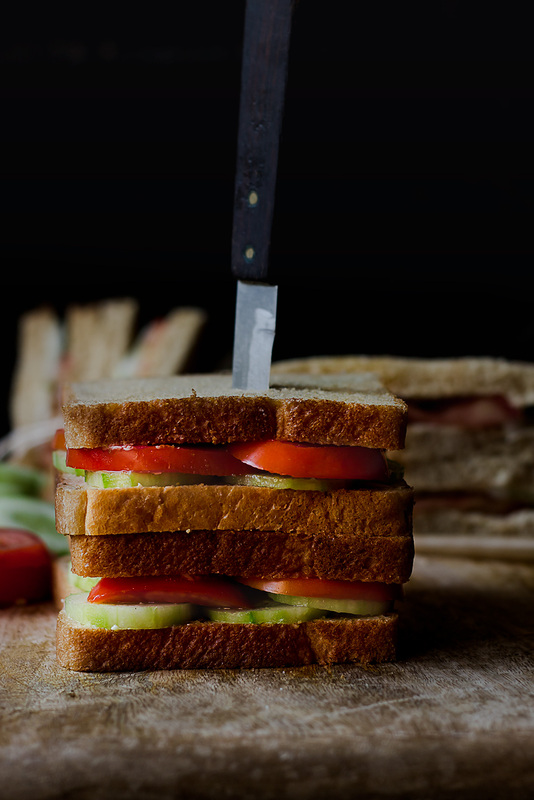 Wrap the prepared sandwiches to keep them fresh and slightly moist at the time of eating. Enjoy with fresh cuppa. I prefer using chaat masala for just a hint of zing to the sandwich. Wrapping the sandwiches in the wet muslin cloth is a must for those fresh, soft taste. They also store well for traveling in muslin. This sandwich is a great hit with kids, adults alike and very easy to make-ahead especially for potlucks/ parties etc as finger food.